Neck problems can cause pain, headaches and a loss of energy. Often referred to as conditions like arthritis of the neck, cervical spondylosis, degenerative disc disease, herniated or bulging disc, strain, and when symptoms extend into the arm, radiculopathy. Along with your health care provider, you may also benefit from home treatment for neck pain. Most of us, at some time in our lives, suffer from some kind of pain in the neck or pain from the neck that is felt in the shoulders, shoulder blades or into the arm. Neck pain can also radiate as far down as the hand with pins and needles or numbness felt into the fingers. Headaches can also be linked to problems in the neck. These neck related problems may vary in intensity and duration. There may be days where no pain is felt and other times when the pain is more constant. People who experience constant neck pain may have to rely on medications and may even have to stop working or reduce other activities which have a disabling effect on their lives in efforts to keep the pain to a minimal level. If you have chronic neck pain, you have been experiencing pain that lasts for months or even years. You may have had treatments that stop or reduce the intensity of the pain, only to find that the pain later returns. Many have had treatments from chiropractors, physical therapists and medical doctors that has failed to alleviate the problem on a long term basis, thus finding it necessary to repeat office visits and medications to get relief. We outline a system of home treatment for neck pain relief directed at current symptoms and preventing future problems. These methods do not work for everyone. It is highly recommended that you seek definitive medical/chiropractic evaluation for any health condition. Sometimes, direct medical intervention is necessary. We focus on methods of home treatments using posture modification, exercises and orthopedic devices which can be safely used in the home setting. In many cases, these methods can make a significant impact on neck pain and provide a more long term and consistent relief. One of the main strategies of home treatment is taking responsibility for the management of your neck pain. If you have developed a problem, you must learn how to deal with the present symptoms in coping effectively and how to deal with preventing future problems. Helping yourself, especially in today’s health care environment, can be one of the most effective and efficient ways for long term management. 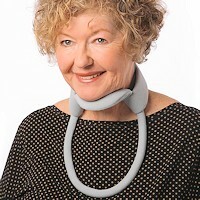 Neck Solutions home treatment is designed for people with straightforward, recurring mechanical neck problems. Most people can begin using the home treatment methods described with some recommended precautions. Carefully watch your pain pattern. Initial discomfort is not uncommon, however, if your pain is getting progressively worse and remains worse the following day or slowly increases in severity and becomes intolerable, you should stop and seek advice from your health care provider. You should always consult a medical professional if you have developed neck pain for the first time, if you have pain in the wrist or hand with pins and needles or numbness in the fingers, if your pain is the result of a recent accident or injury, if you have recently developed headaches (glasses may need to be checked or if headaches are severe and gradually getting worse), or if you are experiencing any nausea or dizziness. 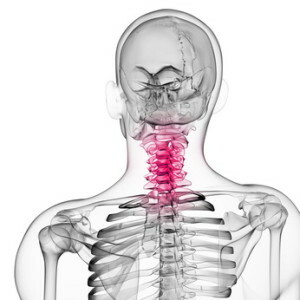 You should be aware of neck pain conditions that require medical attention. Once these are ruled out, you can seek solutions for home treatment. In the neck the spine consists of seven bones called vertebrae which sit on one another like blocks. The front part of the vertebra is called the body, while the back part forms a tunnel for the spinal cord to protect it. The bones form another tunnel between them for the nerves to exit. It is these nerves that go to body parts and extend down the entire arm. Separating the bones are special discs made of cartilage. Each disc has a soft center called the nucleus which is surrounded by a cartilage ring called the annulus. The discs act as shock absorbers and are able to alter their shape to allow smooth motion between the bones. The bones are held together with ligaments over which the muscles attach to the bones via tendons. This system allows for stability and motion and it is the balance of this system which is important to maintain as the neck supports the head which weighs about 10 pounds. The neck is not restricted as other parts of the spine are by the rib cage and pelvis. Due to the flexible nature of the neck it is more vulnerable than the rest of the spine when subject to stress and strain and this is the cause of many problems. The side view of the neck shows a natural curve from the shoulders to the head. When standing or sitting, the head should be positioned directly above the shoulders as the neck curves forward. Due to neglect of posture it is often noted that people carry the head in front of the body as the chin protrudes forward. This distorts the shape of the neck and the curve assumes a position where the joints are bent forward. This places undue stress on the muscles and ligaments of the neck and, when this position persists over an extended period of time, neck problems may develop. More about poor neck posture and how it can effect more than just your neck and why it is so important in home treatment. Pain of mechanical origin may arise when the joints have been placed in a position that overstretches the supporting tissues (muscles and ligaments). The forward posture of the head in relation to the neck places stress in this manner. Whenever we remain in a fixed position for extended periods of time, standing, sitting or lying, overstretching can easily occur. The pain arising from prolonged stretching in abnormal positions is sometimes called postural syndrome. This type of strain can be avoided or corrected once we are properly educated and is largely our responsibility. Mechanical neck pain may also be caused by overstretching to a point where tissues are actually damaged. A fall or whiplash injury can cause damage to supporting ligaments and joints. Damage to muscles may cause a neck strain where the muscle tears or results in neck spasms. This is usually not the cause of chronic or long-term neck pain and, unless severe, usually heals within two weeks. Supporting tissues (ligaments) are often damaged by overstretching and has a more direct affect on the joints. Healing of damage to ligaments (neck sprain) is through scar tissue which is less elastic and movable than normal tissue. Once healed with scar tissue, even normal movements may cause overstretching and become a source for chronic neck pain and headaches. When special ligaments surrounding the disc become damaged, the disc loses its ability absorb shock and the weakened state may allow the soft, inner portion of the disc to bulge or completely herniate through the ligament to put pressure on nerves and/or the spinal cord. This, in addition to the pain sensitive parts of the disc, can cause localized neck pain, as well as pain, numbness and/or tingling in parts away from the neck, such as the arm or hand. In severe cases, there may be a cervical myelopathy, which immediate care should be sought. Posture modifications for standing, sitting and sleeping are important to prevent further overstretching and irritation. 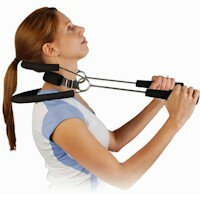 Additionally, we can use neck traction and specific exercises which are designed to affect the joints directly. One of the the most common forms of neck pain is caused by overstretching of ligaments due to postural stress. Sitting with the head protruding forward, reclining with the neck bent and sleeping with improper neck support overstretches the ligaments and places strain on these structures. Once neck problems develop, poor posture will make them worse and cause them to continue. There are many ways to help posture with home treatment for neck pain. Many of us spend most of our work and leisure time with the neck in a protruded forward position. Due to this stress, over time, the neck loses its ability to maintain the normal curvature resulting in weak and improper support. The muscles attempt to perform the function of the ligaments causing stiffness, pain and headaches. The normal view of the neck on x-ray shows nicely outlined bones indicating the discs and cartilage are in good shape with supporting ligaments doing their job. There is a nice forward curve of the neck and balance is achieved. This view shows poor alignment of the neck. There is a loss of the normal curve and the head has translated forward complicating support of the head. 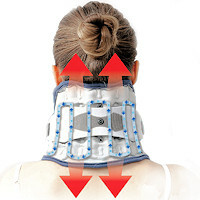 It is evident that the supporting structures are weakened and the outline of the bones indicate degenerative changes in order to stabilize the neck. The pain of postural problems are easily corrected if the right information is obtained in a timely manner. Unfortunately, many people are unaware of simple methods to improve posture and chronic neck pain results with changes to the structure and shape of the joints, loss of elasticity and premature degenerative conditions, such as neck arthritis. Poor neck posture is often a result of poor sitting posture. When we sit and relax in a chair the head and neck slowly protrude as the muscles supporting them begin to fatigue. 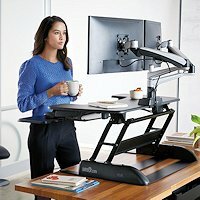 When this happens, we lose support for good posture. We are just not designed to sit for hours in a chair. Multiply this by a forty hour work week and sitting can be your worst enemy. When sitting, your back must be properly supported as this becomes the base for your posture. Proper back support is essential for good sitting posture and good sitting posture is essential for good neck posture. Once poor posture becomes habit and maintained over years, it may cause distortion of discs and alteration of muscles and ligaments resulting in chronic pain. Unless your chair has a modern, ergonomic design, you will not have proper support for the neck and back which will result in continuous strain and linger into positions when you relax for the evening. Fortunately, there are supports that you can add on to your existing chair that are ergonomically designed and comfortable. 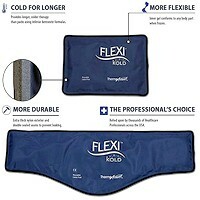 From the elaborate to the simple (rolled up towel), there are ergonomic solutions for just about every sitting situation and this is the place to start in correcting poor neck posture as part of the home treatment for neck pain. Once you have a correct base for sitting, you must learn how to retract the head in order to correct poor neck posture. Retracting the head is the first part of the neck exercises and an essential part of home treatment for neck pain. This neck exercise should done 15-20 times per session for 3 sessions a day, best done in the morning, at noon and in the evening. This teaches you to correctly position your head in relation to the rest of your body. To perform correctly, the head should be retracted (pulled back) as far as possible. The maximum backward/retracted position is a posture of strain and a corrective measure. To sit comfortably and correctly you should hold your head just short of the extreme retracted position. To find the correct neck position, retract you head all the way and then relax and release about ten percent forward. It can take about a week to feel the right position for you, so don’t get too frustrated. You may experience some new pains at first and these should go away in a few days, provided you continue postural correction. Many people find that the position eases their neck pain and headaches immediately. 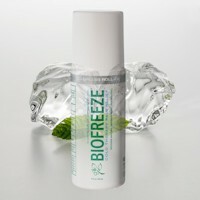 This is a good sign, however, you should continue the regimen and not use it just for temporary pain relief. If you spend a long period of time sitting, you will eventually forget to maintain the correct posture and gradually fall into a position with the head and neck protruding forward. To counteract this, it is essential that you frequently interrupt the forward position by correcting the head position and then perform the neck stretches exercises by stretching the head inward and the neck backward. Try for five to six times per hour. This will relieve stress on the discs and surrounding tissues. 1) Adapted from: Journal of Bodywork and Movement Therapies (2002) 6(1), 67-68. If you wake up in the morning with a stiff and painful neck, it is likely that there is a problem with your pillow and/or sleeping position. The main function of a pillow is to support the head and neck. It should keep alignment between the head, neck and shoulders without tilting or lifting the head. The best sleeping positions are on your back or side. Sleeping on your stomach can place stress on the muscles, ligaments and joints of the neck and since we spend about a third of our lives sleeping, poor neck support from an inadequate pillow can have drastic effects on our necks. The height requirement of a pillow changes as you move from your back to your side. In the side sleeping position, the pillow should be higher due to the width of the shoulders. Unfortunately, most pillows do not perform this function. Fortunately, there are pillows available which can provide a nice solution. 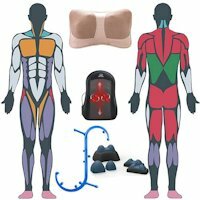 The water filled pillow reacts to changes in positions and supports the head and neck equally in the side or back sleeping positions. 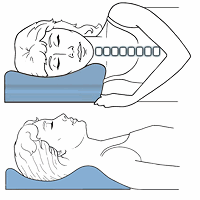 This is important because once you are asleep, you change positions throughout the night and unless a position causes so much pain that it wakes you up, you may spend hours in an unsupported position that can stress the neck. 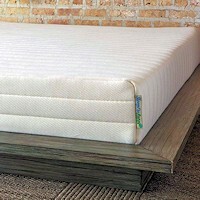 It is very beneficial to have a pillow that can automatically adjust and accommodate these changes. There are many types of pillows available and a good cervical pillow is essential in correcting poor neck posture and as part of home treatment for neck pain. 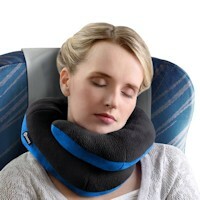 It can be difficult to choose the best pillow for neck pain, however, we have information on how to choose the right neck pillow. It is imperative that the gains we make from the methods described here are not lost to a poorly supportive pillow. In addition to the posture modifications through awareness, back support, exercises, stretches and a properly designed pillow, neck traction can be an effective tool in home treatment for neck pain. Unfortunately, some people have difficulty or are reluctant to perform the exercises. 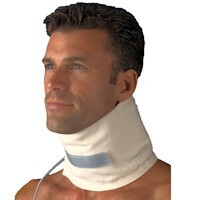 Fortunately, there are neck traction devices which can act as “concentrated exercise” to the neck and help to restore normal posture and structure to the joints. When added to the methods described above, neck traction can reduce the amount of time and increase the effectiveness of your pain relief program. Some are specifically designed to restore the curve. 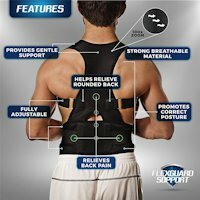 The home neck traction has been clinically proven to have a positive effect on the discs and there are easy to use traction collars. They are designed to provide a carefully applied direct tissue stretch to the part of your neck that is mechanically stressed the most. 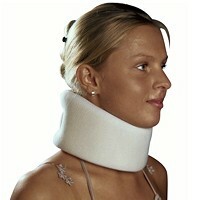 Neck traction has been used for years in the treatment of neck pain. 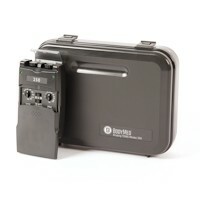 Unfortunately, it has been difficult and cumbersome to use, with most devices employing a heavy water bag or weights with uncomfortable harnesses and hardware that connects to a door. Fortunately, new devices for home use has made traction more effective and easier to use. Collar type traction devices use air pressure to reduce the effects of gravity, poor posture and chronic degeneration of discs and joints. They help to relieve pain by gently lifting the weight of your head off of your neck and shoulders and can be used while sitting. These can be particularly effective to reduce pressure from pinched nerves and herniated or bulging discs enough to begin doing the exercises. The goal of the home treatment for neck pain methods described here are to effect changes in the internal components in and around the joints of the neck. In doing this, you should notice that there are changes in the location and/or intensity of your pain. These responses show that the pain is mechanical (from moving parts) and not life-threatening or serious. When beginning this program, you should stop doing other exercises you may have been shown; for example, a common exercise often taught is to perform circles with your head and neck. 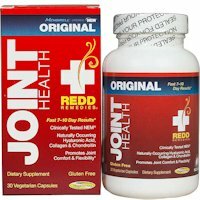 This is not good for the joints and I highly recommend you stop. The purpose of this home treatment for neck pain program is to promote relief by restoring normal function by a combination of active and passive procedures that can be used effectively at home, work or on when traveling. For the rest of your life, whether or not you have neck pain, good posture habits are essential for good health and has the effects of making you look healthier and more confident. By reducing distortions of the muscles, ligaments and joints, the level of neck pain can be reduced along with the likelihood of recurrence. There are three basic reactions regarding pain intensity and location. Your symptoms may disappear: In certain cases the pain first changes location, then reduces in intensity and finally stops altogether. There may be an increase or decrease in the pain: These effects can sometimes change quickly. It is possible to reduce the intensity or change the location of the pain within the first day or two. The pain may move from where you usually feel it to a different location: It is important that you closely observe any changes in the location of your pain. You may notice that pain, originally felt to one side of the neck, across the shoulders or down the arm, moves towards the middle or center of your neck. This is a good sign. You can determine the effects of neck pain on your life and monitor your progress by using the neck pain symptoms questionnaire or the neck disability questionnaire. If the pain increases, other than some initial soreness lasting more than one day, or spreads to places further away from the neck, you should stop and seek advice. New pains that are different from your original pain are to be expected and are the result of movements that your body is not used to. If your neck pain is chronic and present for weeks or months, you should not expect to be pain free within two or three days. Your response may be slower, but if you persist, it is usually just a matter of time before you experience relief using home treatment for neck pain.